Monday this week started off with a bang. 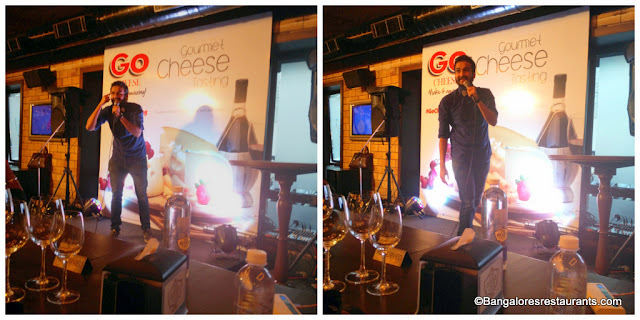 A cheese and wine event hosted by Go Cheese and their brand ambassador, Chef Ranveer Brar in association with Femina India at The Biere Club made for something really interesting to look forward to and beat the Monday Blues. With the ground floor of the Biere Club dedicated to the event, it was a house full soon enough - after all - cheese and wine does have that kind of a fan following. Here's a look-see at what went down that evening. The evening began with some brilliant stand up comedy by Sahil Shah, one of the founding members of the East India Comedy. For a change it was good to listen to someone who was intelligent with his comedy routine, not overtly sexual in his references and quite spontaneous too. How often can you take a simple pair of green pants and include it in your set seamlessly! Sahil's set was spot on, perfectly timed and he brilliantly worked his audience. Taking the stage close behind was Mahesh Israni, Chief Marketing Office of Parag Milk Foods (Gowardhan) who succinctly explained the history of Parag Milk Foods, its products and its aim going forward. Interesting tidbits of information were the facts that Gujarat is the highest consumer of cheese in the country, going as far as putting in shreds of cheese in their pani puri! 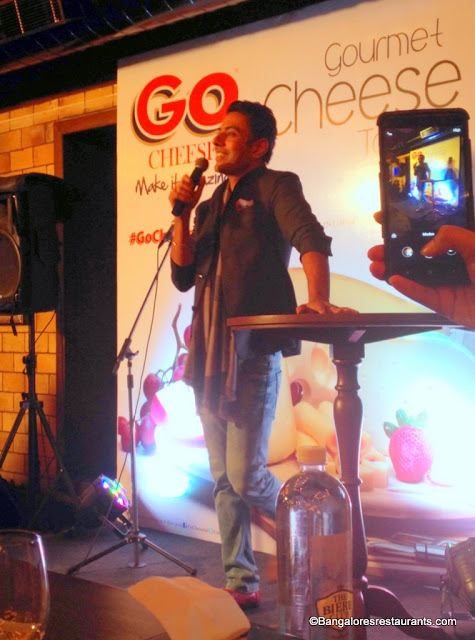 And that Bangalore is the third highest consumer of cheese, with Delhi coming in at a close 4th. 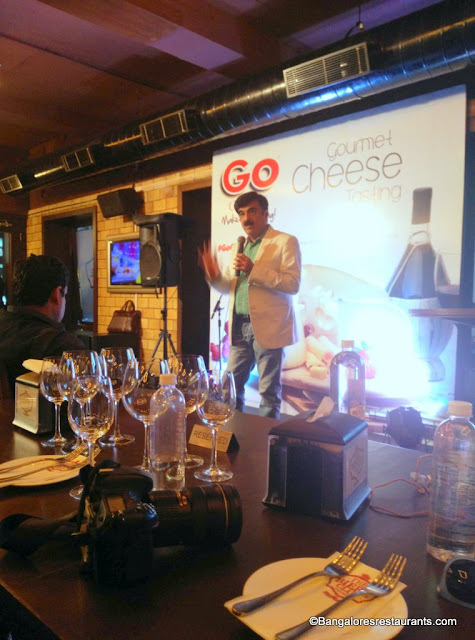 Mahesh said, "We are cheese people and currently have a plant that has the capacity to produce up to 1600 varieties of cheese products (though we aren't right now). 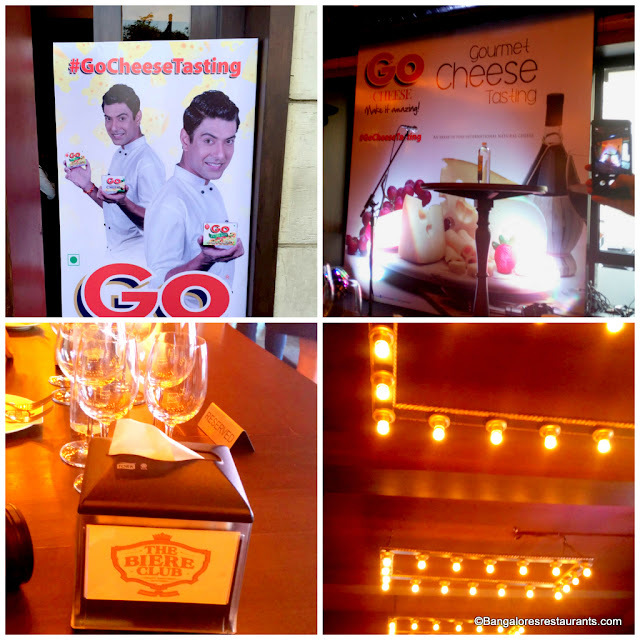 With a 35% growth rate, the cheese segment holds immense potential and is exciting. We have a lot to offer!" At this time, Mahesh also enlightened the audience on the brands Pride of Cows offering of organic milk, untouched by human hands from cow to doorstep. The service is currently present in Maharashtra. And then came the star of the evening - Chef Ranveer Brar. The plan for the evening was simple - a three cheese platter to begin with, followed by a platter of nibbles and then round off with dessert. The pairing was with Krsma wines in red and white varietals, labels of which I did not get a clear look at, though the red is the K2 if I am not wrong. 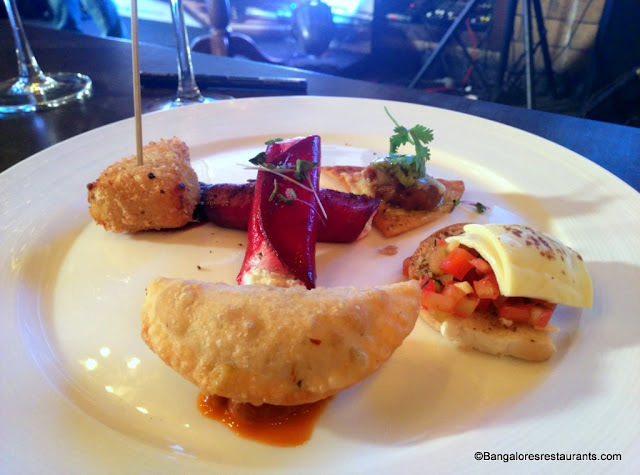 The pairing and tasting was not of the formal variety and Chef Ranveer was clear when he said that at the end of the day, it is your palate and what you think makes a great combination. Pretty much the same kind of advice that comes with most wine pairings and food. He did however mention that a white wine with creamy cheese and a red, stronger wine with hard, sharper cheeses go well. But at the end of the day, all pairing rules are meant to be broken. - Blend together lettuce, lemon juice, pepper, a touch of mayo and some ice to create a sorbet that provides a brilliant offset. - You can also make a jam of half boiled and chopped mushroom, slit chillies by placing them together in a microwave with a seasoning of seasalt. - Give your olives accompaniment an interesting twist with a tadka of panch phoran. - When plums are in season, place them in a microwave, pits and all, with salt, sugar and pepper. Cook till gooey and serve up with your cheese. Next up on the tasting front were dishes made of cheese. Starting with the Cheesy Pepper Agrodolce Calzone with Crumbly Angels Chilli Grape Chutney. The Monterey Jack and Cheddar Cheesy flour nachos with an avocado salsa sauce were brilliant considering the flour had been rubbed with the cheese before being formed into nachos. Next up the Sliced Cheese, Biere Mustard Tomato and Olives bruschetta, which with that sharp hit of mustard was spot on and my pick of the lot - the Beetroot Carpaccio - stuffed with herb Almatte and micro greens - in Chef Ranveer's words, you can't get better cottage cheese than this around! The dessert platter had on the Saffron Cream Syllabub with fresh fruits and Biscotti Crumbles as well as the Almette Cheese Topped Humming Bird Cake with Edible Flowers. 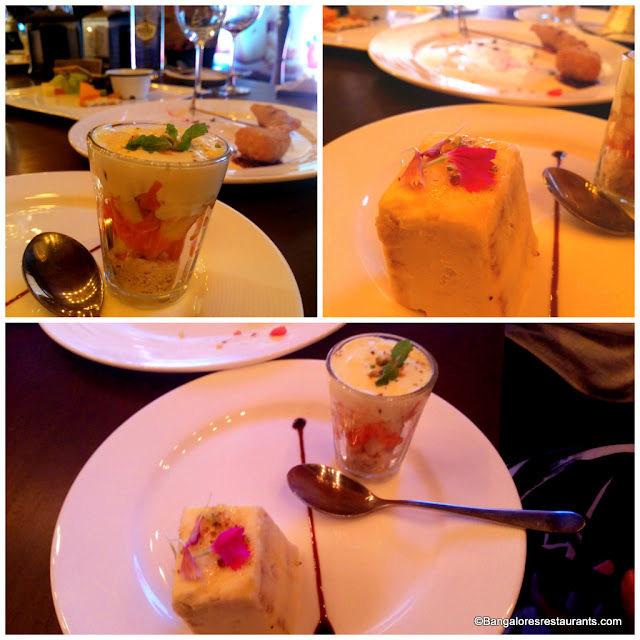 Both pleasant, with a very Indian touch - almost reminding of a kesar kulfi in a toned down version. 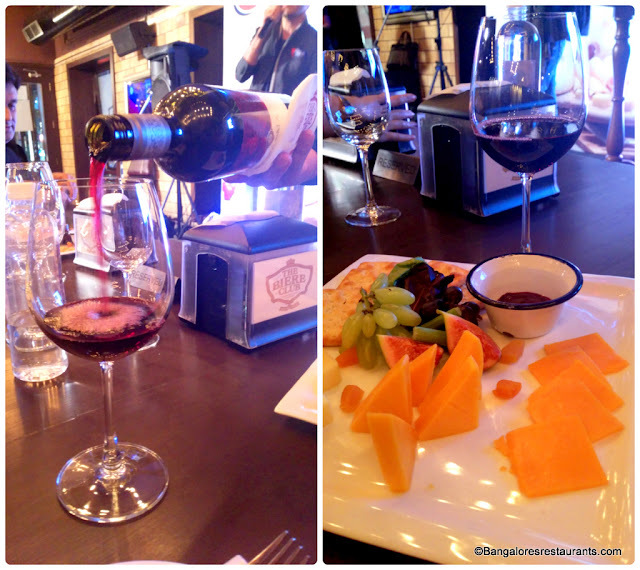 I paired reds all through my tasting preferring to let the tannins get my tastebuds going to get a better feel of the cheese and the dishes made of them. I particularly liked it when I had the mustard tinged bruschetta and the creamy Beetroot Carpaccio. The takeaway for the evening was a hamper of Go Cheese products - Badam milk, Butterscotch milk, plain cheese slices, a box of flavored cheese slices in packs of twos, butter milk and regular milk. The Butterscotch milk was nice cold, but I personally found it a bit too strong on the flavouring. The buttermilk, my anytime drink was great post dinner. The little one who enjoys her cheese sandwiches liked the plain slices both grilled and plain. 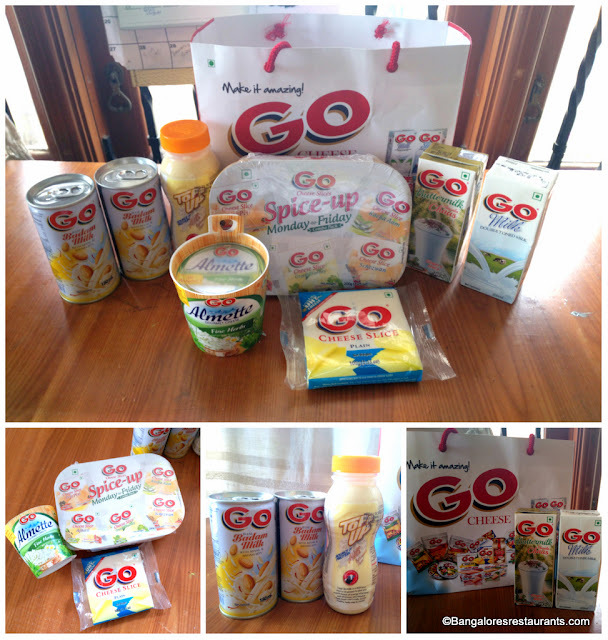 Disclaimer: This post has been published in collaboration with Go Cheese. The views expressed are personal and unbiased.